Guys who have what it takes to be Hot Men of Children's Literature could take a page out of the book of today's featured fella. Half the time I can't act on the nominations I receive simply because I find it impossible to locate photographs of the men that people want me to feature (remember Lane Smith anyone?). In a perfect world, all potential HMOCLs would have blogs filled to overflowing with delightful photographs of themselves in a variety of increasingly frightening poses. And TODAY I have found the world's most perfect HMOCL. He's married (sorry ladies) to a woman who also puts up tons and tons of photos of him on HER blog. Ha ha! Sometimes it's awkward when I suddenly make a fellow I've already met into a HMOCL. Not this guy. Nice fellow through and through and the fact that I love his work as much as I love his wife, just makes today's nomination all the sweeter. Aw yeah. 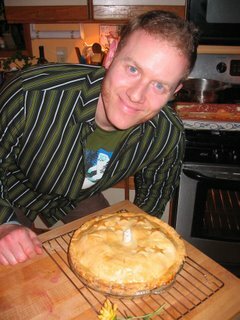 We're into apple-pie-baking, Portland-Oregon-living, red-haired-hipster territory here, kidlits. 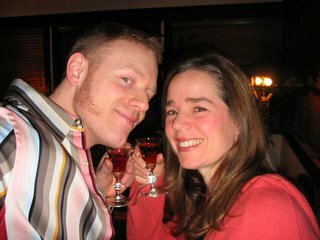 I met Jim formally at the Bar 9 Kidlit Drink Night during the SCBWI Conference here in NYC. Until that moment in time I was only aware of his wife, Laini Taylor, best known at this point in time for writing the 2007 Best Fantasy of the Year (that I've seen, anyway). Here she is snuggling up with her sweetie. Awwww. Just makes you want to buy Jim's shirt for your own husband, doesn't it? Or is that just me? And look at those sideburns! Those are practically J.L. Bell quality, wouldn't you say? God, I love me a good sideburn. Anywho, I got to meet Jim as well at the Drink Night. Not long after I left them I was pulled aside by someone who asked if he wasn't just the most perfect contender for HMOCL status. Which brings us to where we are today. Jim, as it happens, is an illustrator who happens to sport a particularly deft hand. He has a nice website and blog and even a CafePress store that sells apparel with his work on it. And you know what, ladies? Real men aren't afraid to have themselves photographed with their uncool robot buddies. 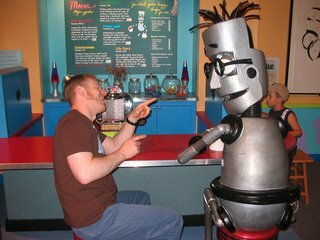 Check out Jim hanging loose with this mechanical Poindexter. Yeah. That's the stuff. That's what you hope for in a HMOCL. I simply couldn't ask for more. I couldn't agree more, Betsy! The sideburns! The pies! And as for the robot friend, there are many robot friends, but most of them are much smaller. I think Jim thinks every story could be made better by the inclusion of robots! He is quite the eye candy. But you're on your own with the shirt. And don't go dissin' the robot. I think he's cute. Hey, I've seen that robot before, when he was a younger actor, in Rumspringa! The Musical.